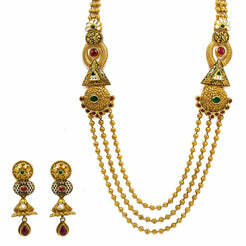 22K Yellow Gold Necklace & Earrings Set W/ Ruby, Emerald, CZ & Large Fan Pendants for women. 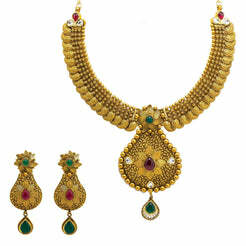 Make a bold statement with this exquisite yellow gold set embellished with precious rubies, emeralds and cubic zirconia in the midst of textured beads, all leading to an ornate engraved fan pendant. 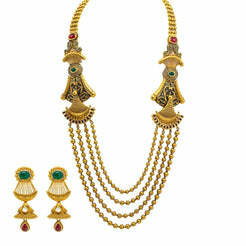 The necklace is 22" long with width range of 2-10.25 mm. Its pendant is 60.75 mm long and 59 mm wide. Each earring is 35 mm long and 24 m wide. 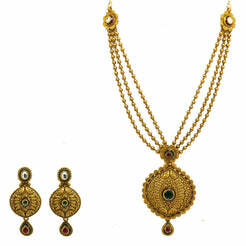 This set is ideal for special occasions such as bridal celebrations.